The Boston Landmarks Orchestra’s venue at the DCR’s Hatch Shell is known for its laid back, welcoming, non-traditional ambiance for an orchestral concert. People bring picnics, children, and even their dogs. A Landmarks concert at the Hatch Shell has a feeling of celebration about it. Added to that, Christopher Wilkins has set up what he calls the Maestro Zone, an area to the side of the stage where young people and the young at heart can follow the lead of the orchestra’s associate conductor in leading the orchestra. Participants are given a straw and can even look at the score which is placed in front of them. Long lines await their turn to see what it’s like to give a downbeat. At all of our Hatch Shell concerts (including weeks when there is a guest orchestra), folding chairs are available to rent at our Information Tent for $5 each. If you are a member of the “Musical Chair” Club, check in at the Information Tent and we will give you a chair to set up on the lawn wherever you’d like. There is no parking on Storrow Drive. Public parking is available at the Boston Common Garage and Charles Circle Laz Parking Lot next to the Massachusetts Eye and Ear Infirmary. A handicap drop off point is available behind the Hatch Shell. Ambassadors are available to help anyone with disabilities, and DCR staff with golf carts are available to bring audience members with disabilities to and from the handicap drop-off point. Braille and large print program books and assisted listening devices are available at the Landmarks Information Tent. Text-to-speech files of program books can be accessed from our website and our mobile app on the day of each concert. At select concerts, ASL interpretation takes place on the left side of the Hatch Shell, closest to the river. 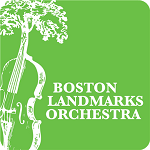 If inclement weather is in the forecast on the day of a concert, please check www.landmarksorchestra.org or call 617-987-2000 after 4 PM for any changes to the date or venue. Download our mobile app to receive weather alerts, notifications, and special offers.